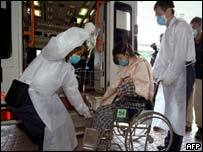 There is growing concern in South-East Asia over the spread of a deadly flu virus. Professor Andrew Burd, a surgeon in Hong Kong, tells BBC News Online what it has been like living and working in the midst of "an invisible killer". This week appeared to begin like any other. In retrospect, however, on Monday I noticed one of the surgeons looking extremely unwell. He was eventually persuaded to go home for some rest. Such an event is not unusual in a hospital where surgeons work long hours and want to remain on duty to support their colleagues and do their job. The rumours began on Tuesday during our daily early morning round. A ward had been quarantined. Staff and patients were shut behind secured doors. The rumours gained credence when we passed the ward and saw an eager reporter speaking to a presumed relative wearing a mask. A photographer was angling for the shot over the shoulder and in the background a security guard was sitting impassively in front of firmly closed doors. The rumours and media reports coalesced over the next 48 hours into an understanding that there was something going on. Could it be possibly related to the strange outbreak of pneumonia that had affected 300 and killed five in Guangzhou in China? Was it related to the strange tale of a family of five who had been to Fujian and who had developed some strange illness that had claimed a father in his 30s and a son under ten. Or was it related to the case of an American businessman who had been evacuated from Hanoi to a specialist unit in Hong Kong during the week? Certainly, something very strange had been going on in South-East Asia and now it was on our doorstep. By Wednesday evening we were formally alerted by the hospital authorities that there was 'a situation' that required heightened measures of vigilance. We had a name to this new threat - "Community Acquired Pneumonia". On Thursday morning, we had the first evidence that we were all in the front line. Arriving for the early morning round we were given facemasks and told to wear them. These were no ordinary surgical masks but the all enveloping masks worn by the DIY fanatic who is building up a dust storm on a British Sunday afternoon with his sander. As we trailed from ward to ward to visit our patients, we saw more and more staff wearing these bright green masks. We felt somewhat self-conscious and joked about alien dust and then sat in offices and took the masks off and wondered what it was all about. On Thursday afternoon, our outpatient clinic was unusually quiet. Many patients did not turn up for their review appointments and those that did were greeted by doctors wearing the obtrusive green masks. By Friday morning, more facts were beginning to emerge. Contrary to rumour and speculation the authorities were not hiding anything. The microbiologists were working round the clock to find out what was going on. There has been a total news blackout from Guangzhou, which unfortunately has fed some more lurid imaginations leading to speculation of mutated viruses, 'air-born aids', and experiments gone wrong. Of these, the possibility of a naturally mutated virus seems the most likely. The numbers of patients in Hong Kong are rising, more hospitals are affected, and there have now been deaths of local people with no history of travel. More details are being established. The two most seriously ill of our colleagues had been to see a patient for a routine consultation. They are two dedicated and conscientious doctors who have always been quick to respond to requests for advice and now they are in hospital themselves, totally unsuspecting victims of this invisible and potentially deadly threat. A group of keen medical students eager to listen to a new 'murmur' also lie in hospital. Nurses from the ward are high amongst the staff victims. We are now looking at over 60 cases and over 40 are medical staff. People no longer make jokes about the masks. The hospital authorities are giving frequent press releases and making statements to the staff to keep everyone informed about the continually developing situation. We have colleagues fighting for their lives. We have an invisible killer in our midst. We are professionals and we have a job to do. Now, as I sit at home with my young son quietly sleeping and my wife pottering in the background, I wonder what tomorrow will bring? We are at war but our enemy has no name, no identity. This reality easily eclipses the nightmare fantasies of Bush and Saddam. For the moment, Iraq is no longer an issue in Hong Kong.